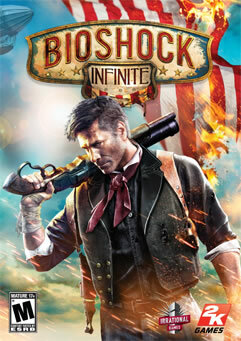 BioShock® Infinite is a first person shooter like you’ve never seen. Just ask the judges from E3 2011, where the Irrational Games title won over 75 editorial awards, including the Game Critics Awards Best of Show. •The City in the Sky: Leave the depths of Rapture to soar among the clouds of Columbia. A technological marvel, the flying city is a beautiful and vibrant world that holds a very dark secret. •Unlikely Mission:Set in 1912, hired gun Booker DeWitt must rescue a mysterious girl from the sky-city of Columbia or never leave it alive. •Whip, Zip, and Kill:Turn the city’s Sky-Lines into weaponized roller coasters as you zip through the flying city and dish out fatal hands-on punishment. •Tear Through Time: Open Tears in time and space to shape the battlefield and turn the tide in combat by pulling weapons, turrets, and other resources out of thin air.